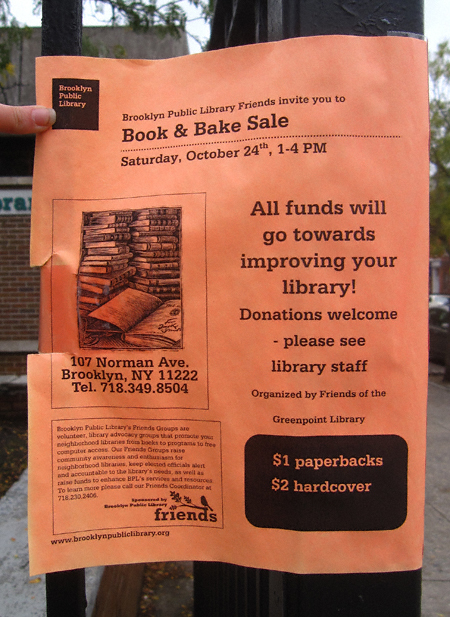 This is a quick reminder that Greenpoint’s very own public library will be having a “Book & Bake Sale” this upcoming Saturday, October 24, starting at 1:00 p.m. A buck for paperbacks and two bucks for hardcovers is hard to beat! What’s more, you’ll be supporting a very worthy cause. October 24, 2009 starting at 1:00 p.m. If you have been meaning to donate books (as I have) or baked goods (I’m am doing everyone a favor by refraining) to this cause it’s time to get moving! P.S. : Those of you who want to become a friend of the Greenpoint Public Library can get the ball rolling by contacting their Friends Coordinator at (718) 230-2406.